It feels like it was just yesterday that we wrote about Payless (ShoeSource) Inc. filing for bankruptcy back in 2017. Well, it's deja vu time because less than two years after emerging from its first Chapter 11, Payless is is preparing for its second trip to bankruptcy court with a plan to shrink the size of the discount shoe chain even further, according to Bloomberg. It's unclear if this filing will be a Chapter 11 or a Chapter 7 liquidation: the retailer, which is seeking a DIP loan, is said to be discussing plans to shutter a significant portion, and potentially all of its North American stores. Once it files - again - Payless will be the latest in a wave of retail bankruptcies (and re-bankruptcies) during the past two years as online rivals and heavy debt overtake once-iconic brands like Toys “R” Us and Sears. And, as we wrote earlier this week, there is no end to the pain in sight, with at least half a dozen names going bust so far this year, including Shopko, FullBeauty Brands, Charlotte Russe, Things Remembered and Gymboree, which like Payless, also filed for bankruptcy last month and is also liquidating most of its operations. In total, since 2016, some 35 retail chains have filed for chapter 11 reporting more than $100M in debt according to Reorg First Day. Payless, which employs more than 18,000 globally and operates about 3,600 outlets worldwide, with more than 2,700 in North America, was founded in 1956 with the goal of selling affordable shoes in a self-service setting and is, or rather was the largest specialty footwear chain in the Western Hemisphere; it was doing great until its 2012 LBO by Golden Gate Capital and Blum Capital Partners, which saddled it with untenable debt, and ended up filing for bankruptcy protection in April 2017. A few months later, it emerged with fewer stores, half the debt load, creditors owning the equity. Just over a year later, it will be filing again in a world where bricks and mortar retailers are now doomed to extinction thanks to an online retailing monopoly whose owner's naked selfies are about to appear in a tabloid. And with Payless set to files its first, and last, Chapter 22, Bloomberg recently published a list of some of the most troubled large retailers who could be at risk of bankruptcy during the year ahead. The luxury retailer is saddled with nearly $5 billion of debt after its 2005 leveraged buyout and its 2013 sale to another set of private equity owners. The retailer has a $2.8 billion loan due next year, and has too much debt relative to its earnings, Moody’s analyst Christina Boni said in an interview. "If we had a magic wand and could get rid of their balance sheet issues, Neiman could move forward, focused on its core operations," she said. The retailer’s 8 percent notes due October 2021 trade at less than 50 cents on the dollar. Its first round of talks with its lenders ended last year in stalemate. The company is trying to talk to creditors again to cut its borrowings. A representative for the Dallas-based retailer said the company is confident it can come to a “mutually beneficial solution” with stakeholders. Neiman Marcus is in full compliance with debt agreements and has ample time to refinance its debt, the representative said. NM is facing a veritable "debt wall" that will be almost impossible for the company to surmount without new financing. Two of the largest pet supply stores continue to face competitive pressures from mega-retailers like Amazon.com Inc. and Walmart Inc. Both PetSmart and Petco have struggled to improve their online sales to help keep competitors at bay. PetSmart acquired Chewy.com in 2017, taking on $2 billion of additional borrowings in the process. Unfortunately, PetSmart’s earnings are declining, making it harder to carry its debt, Moody’s analyst Mickey Chadha said. Petco has less debt, Chadha said, but it remains to be seen whether its own online platform can stay competitive, and both chains are at risk of losing exclusive products that draw shoppers. A representative for Petco said the company rebuilt momentum last year and returned to growth. The company focused on improving nutrition in their pet food, expanded its grooming, training and veterinary services businesses, and achieved “double-digit growth” in e-commerce, the representative said. J.C. Penney has been through it all: boardroom battles, lawsuits, management turnover, activist battles -- and that was just in 2013. In the five years since, it has had three CEOs. The current head, Jill Soltau, took over in October and said the retailer is on track to generate free cash flow in the latest fiscal year and reduce its bloated inventory. To do so, it may have to shutter a whole lot more outlets. The global retail think tank Coresight Research predicted one fifth of U.S. department stores -- about 1,150 -- will close between 2017 and 2023 no matter what they do. “The U.S. has far too many department stores,” said Deborah Weinswig, Coresight’s CEO. "In particular, it has far too many midmarket department stores that are competing in a similar, and highly challenged, space." 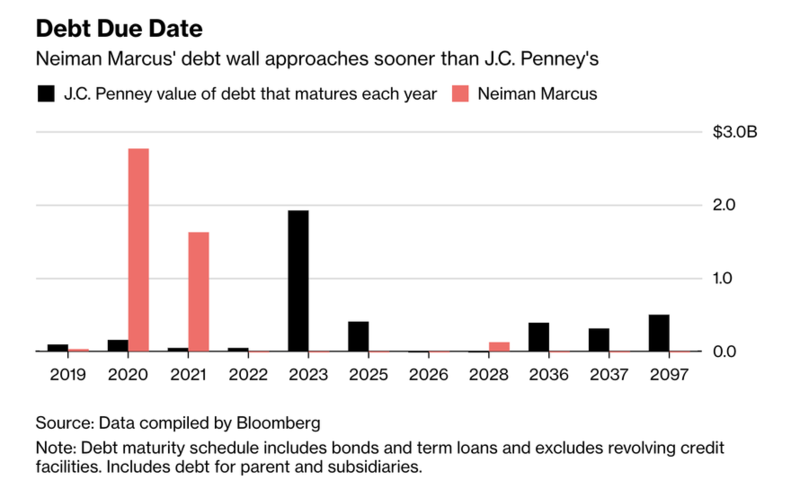 A spokeswoman for J.C. Penney said that credit rating firms have maintained their highest liquidity rating for the retailer, and it has only $160 million of its more than $4 billion of debt coming due in the next four years. Over the past four years, the owner of brands such as London Fog and Mossimo has endured a U.S. Securities and Exchange Commission accounting investigation, which isn’t over, and the departure of its founder as sales steadily slid. Now, Iconix has around $700 million of debt, including more than $100 million of busted convertible notes due 2023, which trade at about 44 cents on the dollar. It’s even fighting with Jay-Z over his Rocawear brand, which it acquired in 2007. Eric Rosenthal, senior director of leveraged finance at Fitch Ratings, says the company is a “likely default” this year. Representatives for Iconix didn’t return requests for comment. Finally, as if the situation wasn't already dire enough, just imagine what will happen to the US legacy retail sector when the next recession finally arrives.